dinner at his taco stand in Manoa. Serg shut off a small section of the patio and placed a sign in front that said "Private Party". This about made me cry. 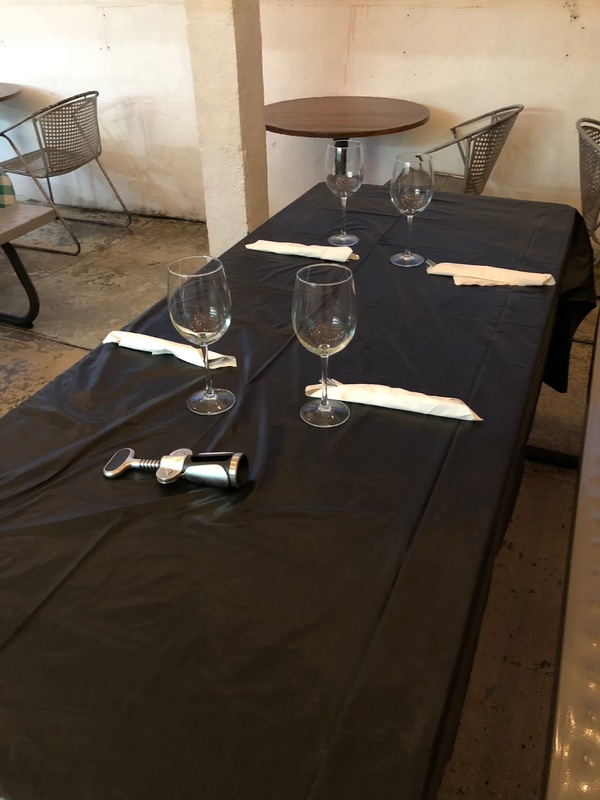 As I looked in the back, there was a black tablecloth with wine glasses set for the evening. Wanted to cry again. This was so cool and unexpected. As we sat down we already knew we made the right choice for our Anniversary dinner. As the evening progressed we knew this was one of the best meals and evenings of our lives. The setting in Manoa on the patio with my Wife and Daughter was far better than any fine dining restaurant on the planet. This was where we were supposed to be on this night. It was meant to be. Chef Serg's Wife joined us as the Garlic Bread and Antipasto Salad hit the table. She is a local girl and comes from a family of eleven children. She met Serg while they were both working in Las Vegas. Serg was a chef at several casinos, fine dining restaurants, Italian and Mexican Restaurants and even a personal chef for a casino tycoon. The guy truly has cooked everything you can imagine and he really does them all well. Serg and his Wife decided to leave the Las Vegas life and move back to Hawaii. They arrived with absolutely no money and within three months he opened Serg's Mexican Kitchen in Manoa. The restaurant was an immediate success with lines of people waiting for Serg's Mexican food day after day. 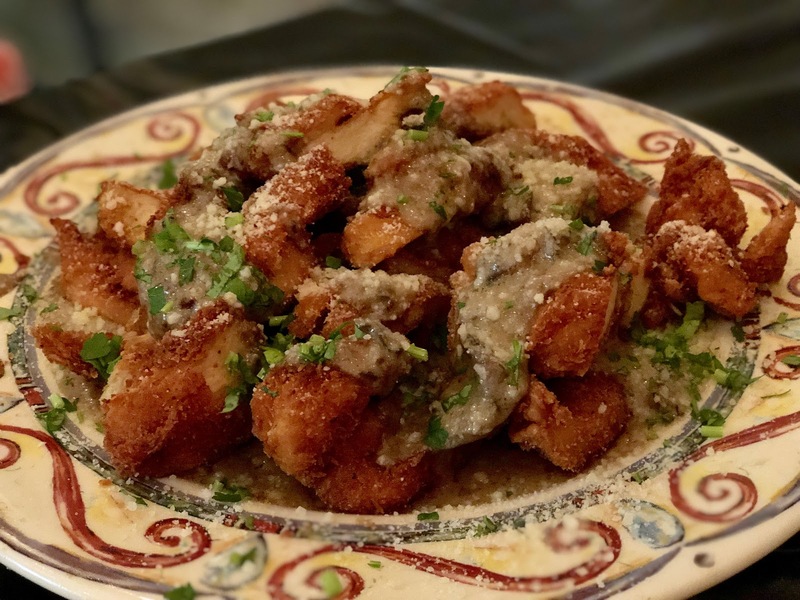 To set up and create a restaurant, buy ingredients and develop a menu with no money is a testament to Serg's character, hard work ethic and burning desire to succeed and take care of his family. The man is a working machine with one of the biggest hearts I have ever met. There is nothing Serg would not do for others and on this night he spent the entire day cooking up a menu for my family that truly was amazing. After getting us settled I opened a bottle of wine that I had brought for the evening. Actually brought a few and we polished them all off. Since my Wife does not drink it was up to Serg and me to finish the wine. 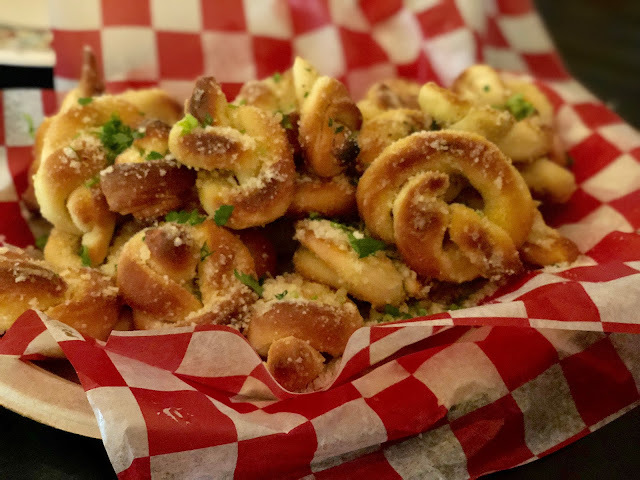 First up Serg brought out braided Garlic Rolls with Parmesan Cheese. My Daughter went nuts over these carb treats and so did my Wife. 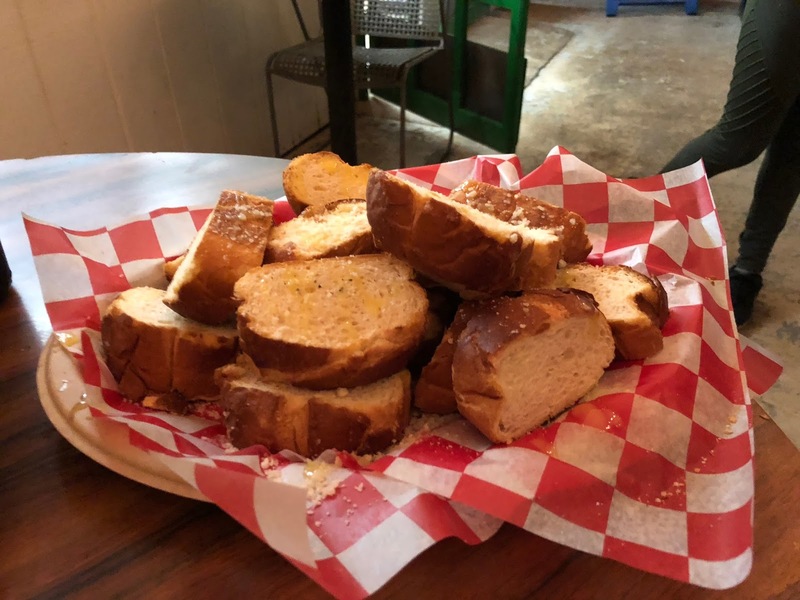 They put a big dent in the basket of bread and I think would have finished them all if they could. Next up was the Antipasti Salad with homemade Balsamic Dressing. 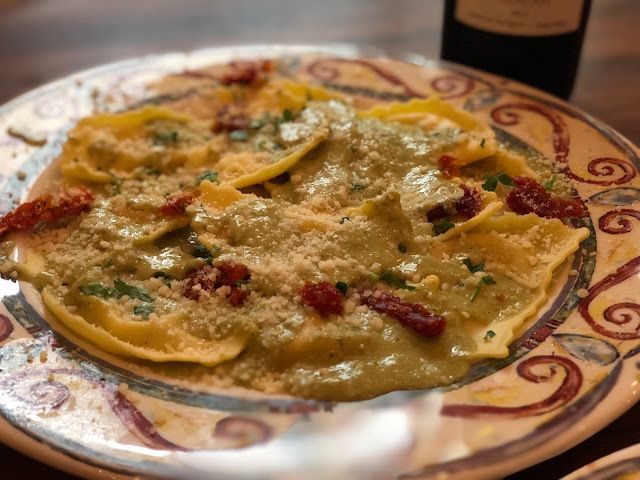 Full of cheeses, Italian meats and vegetables. 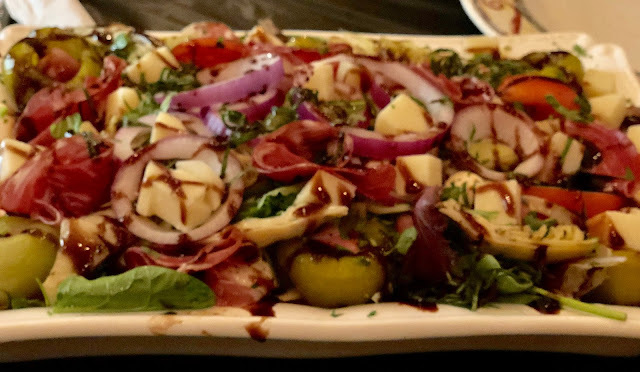 Probably the best Antipasti Salad I have had in Hawaii. Serg sat down and joined us as the main courses began to arrive. First up were the Meatballs with Rigatoni. 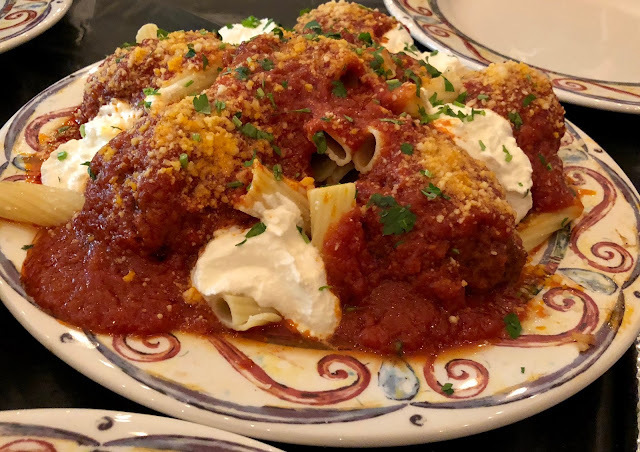 I had just come from Las Vegas and enjoyed Rao's Meatballs which are famous. They are really good. Serg's Meatballs I can honestly say were better. So moist and full of flavor. The sauce brought the Meatballs to another level and the entire family loved them. I asked Serg what type of meats he uses in the Meatballs. Must have some Pork and Veal in there I thought. Nope he said, they are all beef. To make a Meatball this good and moist with all beef impressed me. Next up was Chicken Marsala. Lightly breaded and fried chicken with a Mushroom Marsala Sauce. Simply delicious. 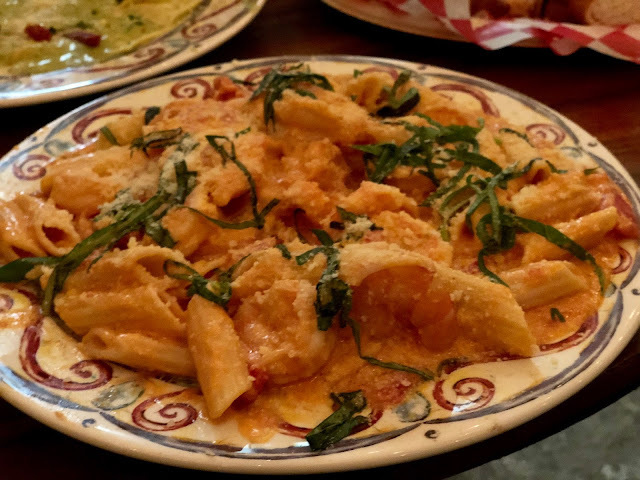 The Penne Pasta with Shrimp Vodka Sauce was incredible. Huge Shrimp and a velvety sauce that was delicious. I was so satisfied here but there was much more to come. Lobster Ravioli was next and it was amazing. The Ravioli was cooked perfectly and the taste of the Lobster shined through. So happy. We kept going back and forth for seconds and thirds. Amazing how much we ate I thought but there was plenty left over. Serg insisted on bringing out dessert so he went back into the kitchen and returned with a massive plate covered in whipped cream and chocolate sauce. 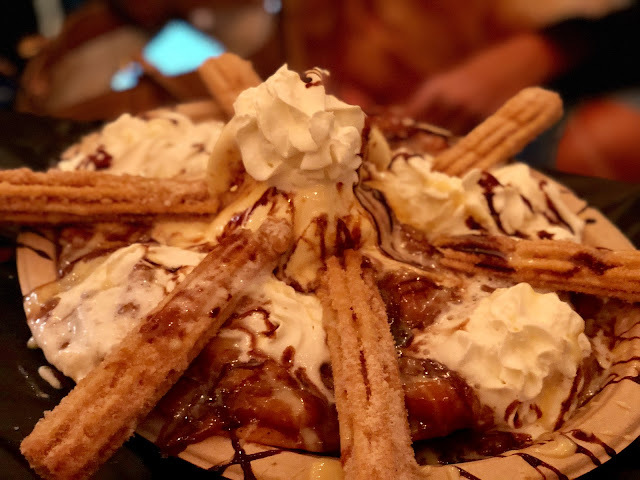 There was a fried tortilla on the bottom topped with ice cream, sauce and several Churros. Out of this world delicious. The topper to this evening is that Serg did not know it was our Anniversary prior to the dinner. We told him when we got there. This is a dinner he prepared for us out of the goodness of his heart. Love the man! Amazing how things happen in life. We were not expecting anything big for our special day and we end up at a Mexican restaurant and have the dinner and time of our lives. 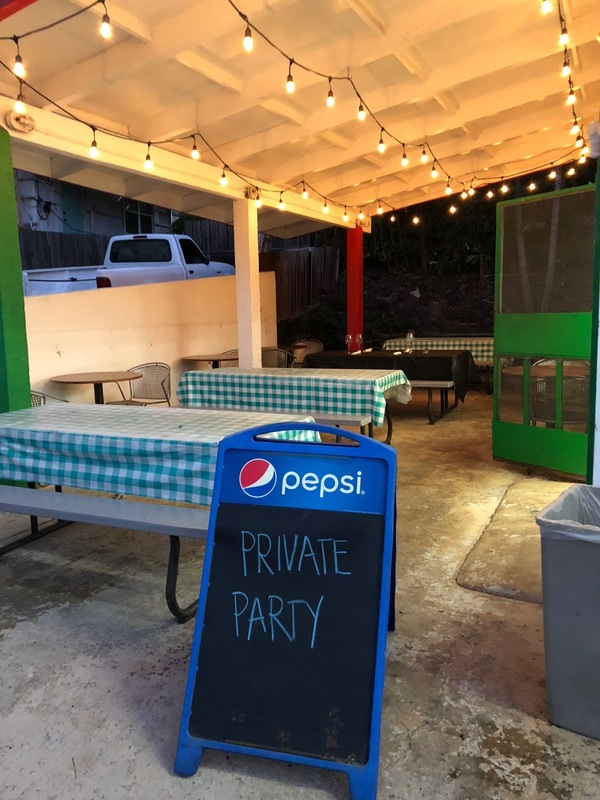 After dinner this night I decided to join Chef Serg in renovating this space and bringing a Pizza, Wings and Greens concept restaurant to Manoa. Mama Manoa was born and is now open. THIS WAS OH SO GOOD! Drew: What a lovely post! Happy belated anniversary. I've read your blog off/on over the last few years. I enjoy each/every one, the trips, family events and home parties are the best! 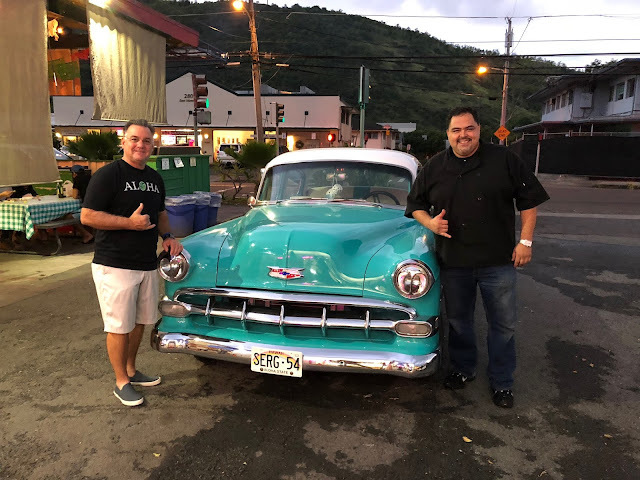 I grew up in Manoa Valley, so this post takes me back there. Moved away 32 years ago, as much as has changed, a lot still the same from what I see, based on your blog. Thank you for sharing so much, the pics, to the point reviews, everything. Well done and engaging. MAMA MANOA PIZZA COMING SOON!! !